How would your life story change if I told you there was no such thing as what you’re "supposed" to do? What if you didn't have to live by the script that was handed down to you? What if you could create a life on your own terms? This insightful and inspirational book will guide you through the process of rewriting your life story and starting to live a life of adventure and purpose. After leaving the 9-5 corporate world to become an entrepreneur, I quickly realized that there is more to life than creating an income or a savings account. I'm sure you can relate - perhaps you feel lost or unsure of what to do next with your life. Are you stuck? If you feel compelled to live by the wash, rinse and repeat cycle that was passed down to you, then you’re in the right place. Go to college, get a degree, find a job, go to work, get married, have kids, retire, hopefully leave a legacy. Deep down, you know there has to be more to life. It's time to get off the hamster wheel. But how? How can you leave a legacy behind when the rules have been written by someone else, limited by their fears, dictated by their failures and their experiences? More importantly, what if you could deploy the principles in Life Re-Scripted to discover your purpose in life right now? Life Re-Scripted is a tool that will transform your fears and inspire you to redesign your story. Follow the advice in this book and you will find that you can make changes to your life in as little as an afternoon. So how will your story end? It’s your choice. 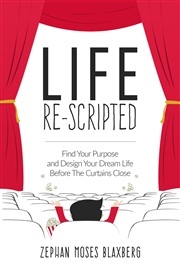 Rescript your life. Do it for you. Zephan Moses Blaxberg is the founder and host of the iTunes "New & Noteworthy" acclaimed Year Of Purpose Podcast where he interviews motivators and inspirational humans from all over the world who are living life on their own terms. He is one of the top authorities and mentors to those who are tired of living a mediocre life. Zephan has held every job in the book from pastry chef to working at the Apple Store Genius Bar. He even founded a highly successful video production company landing him opportunities in the White House and on set for a Netflix Original Series. His videos can be seen in football stadiums and on major TV stations across the United States. After realizing that there was more to life than settling for the script that had been handed down to him, he took a two month hiatus from life to couch-surf and travel hack his way around the country. When he got back the Year Of Purpose Podcast was born. Since then he has dedicated his life to empowering others to discover what makes them tick and how they can lead a Life Re-Scripted. Zephan now mentors his peers to discover their purpose in less time so that they can live the dream life they've always wanted.